Production by: Vix Prod. Co.
“Did you know that there’s more neurons in the human brain than stars in the Milky Way Galaxy?” Mason (Chris Mason) is going to attempt to map every single neuron. “If you added up the signals from the entire telecommunications system on earth it would not equal the complexity of a single human brain. The only hope of rewriting a system so complex is to fully understand its structure. Zip (Brandon Scott) here is finishing a code that will allow us to map the entire human brain. Learn from that code and rewrite that code.” If Mason can map the human brain he thinks he will be able to hack it like software and rewrite human behavior to fix all that is wrong with the world. Can he even fix himself? “Sometimes you have to destroy systems to build new ones.” Sometimes you can’t even save yourself. Director Royce Gorsuch lived among a group of hackers before the production of his first feature. The result of such dedication is the best hacker movie I’ve seen since, well Hackers in 1995. Admittedly while there’s a ton of movies with hackers in them, there’s few movies out there primarily about hackers hacking as the main plotline. I’m sure I’ve missed quite a few of the ones that do exist. Gorsuch’s hack job of a first film isn’t just an online cyberwar as Mason tries to hack the human mind. While it may not be the typical horror review from a Headless Critic, this Mad Genius delves deep into the human psyche while wearing a horror movie worthy mask. Mildly reminiscent of Eternal Sunshine and the mind hackers in Inception, Mad Genius holds on to the 1995 Hackers feel set in futuristic form. Mad Genius casts underutilized actor Scott Mechlowicz in a dual personality supporting role. Mechlowicz always stands out to me in any character he plays including a multiple personality come to life. Casting all around is done well including love interest for your feminine side Sawyer (Spencer Locke). The cast portray a future of hip youths that handle technology a step above the rest of us, doing it trendily well. The sci-fi futuristic aspect did lose me a little in its mind meld of human and hard drive. When a manifestation of a multiple personality becomes a physical being, the lines of reality become distorted enough to not know what to believe, removing your trust from the plot you’ve been following. 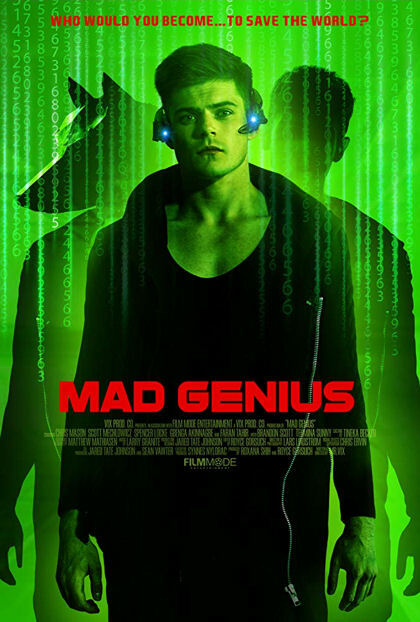 The concept of Mad Genius is futuristic Sci-Fi but this fun cast may have been better grounded in reality as a group of your friendly neighborhood hackers. The depth of Inception isn’t quite reached, only scratching the surface of such a layered level of reality and brilliance in filmmaking.